I was searching for the option to display the report output on the same selection-screen from quite a long time. SDN Forum thread How can i display output in the same selection screen reminded me again to research on this topic. Doesn’t it look good ? After reading the problem in the thread, suddenly I got a strike: Why not to create a Docking Container and place the ALV inside it..!! Here is the code which will generate the output as shown in the second picture. SELECTION-SCREEN: BEGIN OF BLOCK blk1 WITH FRAME TITLE aaa. SELECTION-SCREEN: END   OF BLOCK blk1. MESSAGE s398(00) WITH 'No data selected'. EXPORT data = me->t_data TO MEMORY ID sy-cprog. lo_alv  TYPE REF TO cl_salv_table. IMPORT data = me->t_data FROM MEMORY ID sy-cprog. CHECK me->t_data IS NOT INITIAL. MESSAGE 'Error in the Docking control' TYPE 'S'. Wondful! Thanks a lot for sharing! This CL_SALV_TABLE only avliable from the ECC 5.0. If you are in the lower version than you can try it with the CL_GUI_ALV_GRID. I will update this post, once I will do it. Hey i need to display two alv grids in a single screen . can u give me any suggestions?? is there any way of doing it without using Object oriented methodology ? I wanna show an ALV display, after pressing back i m exporting a field to ABAP MEMORY using EXPORT , and i m checking it in INITIALIZATION event..but when i leave the program and go to SE38 & again execute , i want that memory to be refreshed..Also pgm is having selction screen so from selection screen i may not execute but press EXIT and go to SE38….my pbm is this exported field value is retained (obviously as its ABAP memory) when i import in INITIALIZATION..is there any other way out ? We need to FREE the memory id. See the method GENERATE_OUTPUT and specially very first two lines in the given example. Here I do the IMPORT and just after that I refresh the memory using FREE MEMORY ID… If you have this statement than it would not come back when you run next time. However I just have one question: Can you only use the standard pf status in this alv? If not, how do I add a button to it? I tried setting the pfStatus but it says it's not supported if the ALV isn't on fullscreen. Can you only use the standard pf status in this alv? If not, how do I add a button to it? I tried setting the pfStatus but it says it's not supported if the ALV isn't on fullscreen. We can add our own defined buttons as we add the ALV created with the CL_GUI_ALV_GRID. To add your own button, Check the program SALV_DEMO_TABLE_FUNCTIONS and Subroutine D0100_PBO. We can use the method ADD_FUNCTION of reference LO_FUNCTION. Too easy Naimesh! That's perfect. Thanks a million for your help, and the speedy response. I wanted to display the customer information so ichanged other variable and work area accordingly. But when i execute it i dont get the alv display with the customer inforamtion. I want to create alv grid control report for custimmized two tables (input one table amd output another). oo-alv grid for custamized report for two or more tables. The coding is simply awesome. but is it going work in 4.7E version? can we generate spool request in dat?? I have published an article.They have said me that it is some what similar to your work with modifications and asked me to notify you. I was not aware of this blog befor posting. Also I am new to ABAP. Am undergoing training. I was working with similar scenario. So i have posted. I want to learn RFC function module. Pl. possible pl. send the basic step. Can you please share the code how we will show the Dynamic selection screen. Here you go for my qiestion. I have two radio buttons in the selection screen . 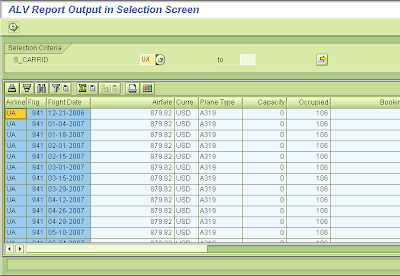 If i select Purchase Order my selection screen should load with Purchase Order Number.